Our Easy Marshmallow Recipe comes straight from the family restaurant. They were used in and on an assortment of goodies, chocolate graham pancakes, brownies, rocky road pie, and my favorite toasted in a hot cup of cocoa! These marshmallows are easy to make, and once they’re set you’ll have a fluffy fresh batch to use as you please. The prep and cook are simple, you can use a stand or hand mixer. Warning: Working with bubbling hot sugar can be dangerous. Sugar burns are extra painful because the sugar sticks to your skin, so please be careful when working with sugar syrup. Marshmallows are a mixture of gelatin and cooked sugar syrup. The prep and cook time take a few minutes, once that’s done they need at least 6 hours to set (although I’ve cut several batches after 4 hours). 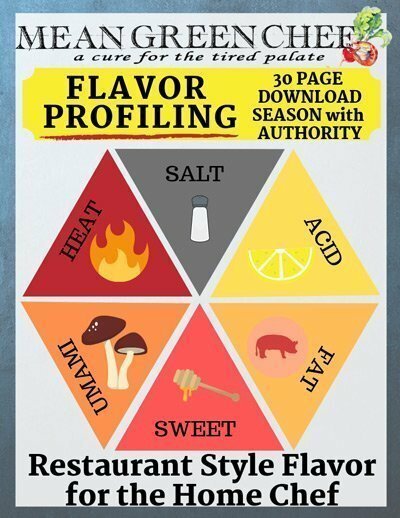 There are many things that can be prepared in the kitchen by eyeballing, seasoning and spices can be added here and there to taste. BUT, creating candy is not one of them (nor is baking, but I’ll save grams for another day). This recipe absolutely must be the precise temp. We bring the sugar syrup to exactly 240°F/115°C. Remember to be careful while cooking and handling the hot syrup! What Pan should I Use for Making Marshmallows? We utilize a 9×9 (pictured size) or an 8×8 inch pan, used for brownies as well but this sized pan gives a nice fluffy weight to these marshmallows. You can always use a 9x 13 too, the marshmallows will just be a bit thinner. 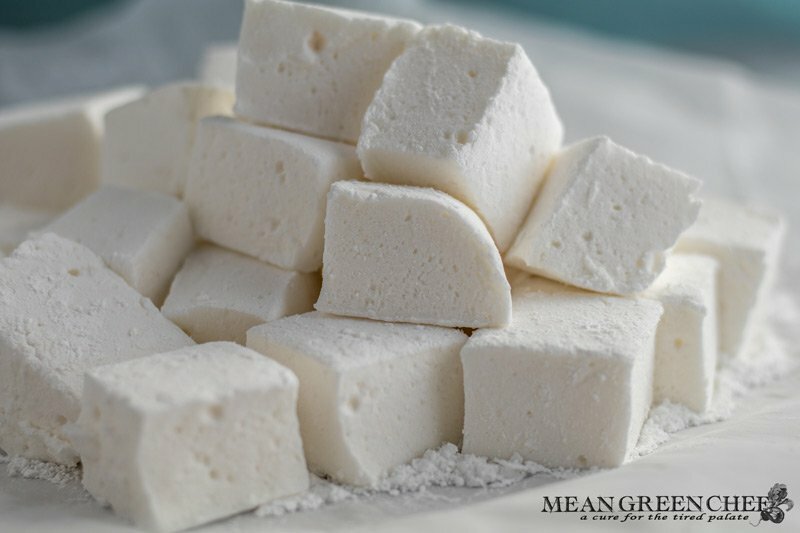 How do I Cut Homemade Marshmallows? After the marshmallows are set, it’s time to cut them! They’ll be sticky so here are a couple of tips for keeping things a little less messy. Use a long thin knife, such as a chef’s knife or a pizza wheel (which makes it a snap). To prevent sticking, dust your knife or cutting wheel with confectioners’ sugar. Continue to dust in between cuts as needed. For larger marshmallows, cut the square lengthwise into six strips then cut the strips into sixths. For smaller marshmallows cut the square lengthwise into eight strips, then cut the strips crosswise into eighths. Once the squares are cut, coat them in additional confectioners’ sugar, shaking off any excess. How do I Store Homemade Marshmallows? Store homemade marshmallows, layered between sheets of parchment paper, in an airtight container. Keep in a cool dry place, they’ll keep for 3 weeks. Marshmallows that include mix-ins or have been dipped in chocolate will have a shorter shelf life. Extract Flavors: Almond, peppermint or other extract flavors. Use 1 1/2 teaspoons of flavored extract in place of the vanilla extract. Chocolate Dipped: Melt together 6 ounces semisweet or bittersweet chocolate and 1 1/2 tablespoons of coconut or vegetable oil. Brush excess powdered sugar off the marshmallows before dipping the smooth side into the chocolate. Set on parchment with chocolate side up. Will stay fresh for 2 days at room temp. Mini Chocolate Chips: Mix in mini-chocolate chips, just prior to pouring into the pan to set. Funfetti: Add 1 1/2 teaspoons butter flavored extract in addition to the vanilla. After coating the pan with the powdered sugar toss 1/2 cup of rainbow sprinkles into the bottom of the pan, spread out evenly and then pour the marshmallow on top. Our Easy Marshmallow Recipe comes straight from the family restaurant. They were used in and on an assortment of goodies! Get creative and have fun, these are easy and tasty! Combine the gelatin and 1/2 cup water in a mixing bowl stir briefly to combine; set aside, to allow the gelatin to bloom. In a small, heavy-bottomed saucepan, combine the sugar, corn syrup, salt, and remaining 1/2 cup water. Place over medium-high heat and cook until the sugar syrup comes to a boil. gently swirl the pan to distribute the heat. After 2 minutes, remove the lid, check to make sure there are no sugar crystals on the side of the saucepan. If there are crystals, then cover the saucepan for another minute to allow the condensation to wash down the crystals into the syrup. Uncover and clip the sugar thermometer to the side of the saucepan. Let the sugar syrup cook until it reaches 245°F/118°C. Once the sugar syrup reaches 245°F/118°C, remove it from the heat and let the bubbling subside. Turn your mixer on medium-low and begin to pour the syrup into the gelatin, down the side of the mixing bowl. Whisk on medium-high for 5 minutes until the marshmallow base has doubled in size and becomes glossy white and fluffy. Mix for another 5 minutes on high speed, which increases the volume of the marshmallows further. As the mixer is running, prepare your pan. Line a 9x9 or 8x8 pan with parchment paper and then spray with non-stick cooking spray or coconut oil. Then sprinkle with powdered sugar. Add the vanilla, to the marshmallow base and whisk for a further minute on high speed to combine the vanilla. Scrape the marshmallow base into the prepared pan using a flexible scraper. Spread the marshmallow evenly in the pan, sift confectioners' sugar over the top of the marshmallow and allow the marshmallow to set for at least 4 hours. After the marshmallows have set lift the parchment paper out of the pan onto a work surface. Cut the marshmallows with a long sharp chef's knife that has been dusted in powdered sugar. Dusting more as you cut if needed. If you love sweet candy treats you make like our other recipe ideas too! We 💚 LOVE 💙 seeing your creations! Please be sure to tag us @meangreenchef or #meangreenchef so we can see what’s happening in your kitchen!